Steve Silver reports on how track worker Assafa Hadish survived a horrific accident at work and how RMT supported him. 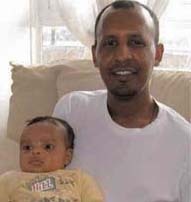 Assafa Hadish was carrying out a railway track inspection at Leatherhead one August morning in 2007, as he had done many times before. It was just another day at work and the best time of year to be working outdoors. The next thing RMT member Assafa recalls is awaking, disorientated, in a hospital bed. He had been in a coma for three weeks after being hit by a train. Assafa was to spend a total of six weeks in the Royal London Hospital, confused as to what had happened. His injuries were horrendous. He had broken both legs, his right hand had been dislocated, neck and vertebrae fractured, his ribs broken both sides and he had suffered head injuries. Yet when RMT News visited Assafa in his flat near Elephant and Castle in South London – less than a year after the accident – he was walking about and keen to tell his story. The doctors told Assafa that they could not believe that he had survived the accident. They said that the prognosis for him making any kind of recovery was very poor. “The doctors read my notes and said it is a miracle that I survived; and I believe it was a miracle,” he says. When Assafa came round from his coma, the first thing he did was call out for his young son, Joseph. Meanwhile, the trauma of the accident had a big effect on Aster, Assafa’s wife, who was nine weeks pregnant with their second child. “There were complications, and I could have lost the baby”, she says. But today Assafa is the proud father of a second son, Nahome, who sits on his dad’s lap while we talk. It may be a miracle that Assafa survived the accident, but the road to recovery is a long one. A big operation was carried out on his legs which required plates and pinning. “I am getting better all the time though,” Assafa says, largely as a result of the physiotherapy that he has been undertaking so that he could walk again. He can walk, but only short distances and he finds crossing the road frightening. If he has to go the post office he can only go in if there is a short queue as he can’t stand for long periods of time. The investigation into the accident concluded that no one individual was to blame. Obviously, Assafa is still keen to know what happened that day. He was well known to his colleagues as a safety advocate, which makes the accident all the more puzzling. He makes special mention of Russell Knott, the Area Council Rep and Paul McDonnell, his branch secretary, who have been helping and advising him during his road to recovery. “I have to say that Ben Edwards, a manager from Network Rail at Clapham, has been exceptional too. He has even visited me on Sundays in his own time and has been dedicated to helping me,” he adds. Assafa looks forward to the day that he can return to work, although he says that being a trackman was a difficult way to earn a living. “The wages are low, so you have to work overtime. Sometimes we worked 13 days in a row,” he says. Meanwhile, Assafa takes one day at a time, recovering and enjoying life with his new addition to the family.